Featured image “Taxi for 17” of a Boeing-Stearman taken by Lane Pearman, used under license CC by 2.0. Nothing says “Adventure” like a radial engine biplane tearing through the clouds, and the Boeing-Stearman Model 75 says it loudest of all. According to Warbird Alley1, of the 10,584 airplanes built (around 8,584 fully built, with the equivalent of 2,000 more planes worth of spare parts2, 7), 1,000 are still flying today, whether it’s dusting/spraying crops or flying aerobatic shows with revved up engines. The Model 75 was introduced to the United States Army Air Forces as a military trainer aircraft in 1934 and remained in production through 1945. The Model 75 went through a few variants and dozens of subvariants over its careers in the USAF, the Navy, and the Royal Canadian Air Force (where it gained the name “Kaydet”1) with the USAF giving the airplane three different designations based on the engine in the airplane. The PT-17 was the most popular, with 3,519 airplanes built. The average cost to the military for each biplane was between $10-11,000 ($201,000 with inflation – pricey, but still much cheaper than the $4.272 million T-6 Texan II9, a USAF single-engine turboprop trainer)2, 8. After WWII when production of the Model 75 ended, civilians could pick up their very own at auction for roughly $500 ($6,700 with inflation)2, which made them very popular for both agricultural and aerobatic use.8 In fact, Captain Billy Walker, an experienced pilot and aviation expert, says that “Crop dusters saved the Stearman.” If there hadn’t been such a market for these airplanes, he says it’s unlikely that so many would be alive and airworthy today. 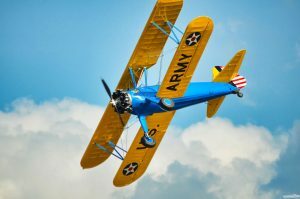 When Boeing signed Stearman on as a subsidiary in 1934 and put them to work building a trainer for the military, no one anticipated just how successful their little biplane trainer would become2. Easy to fly and simple to maintain, this incredibly sturdy wood, metal, and fabric biplane became known as fairly forgiving of new pilots while still requiring their full attention (mostly regarding coordination)1. I got in touch with Captain Billy Walker just as he was touching down after a flight in his Boeing-Stearman Model 75 biplane. I asked him how he was doing, to which he replied, “Handsome, but humble.” I immediately knew this was going to be a fun chat. Captain Billy Walker, from his personal website captainbillywalker.com. After spending 20 years flying for Frontier Airlines, Captain Walker spent some time with the Air Line Pilots Association and America West Airlines (training pilots to fly the Airbus) before joining the JetBlue Airways start up team. He was an FAA examiner and test pilot for the Airbus A-320, and has flown over 250 varieties of aircraft over his career as a pilot. Captain Walker restored and sold his Boeing-Stearman Navy N2S-3 964 to the Commemorative Air Force, where it is flown at the Arizona Airbase (owned by the American Airpower Heritage Foundation) by him and four other pilots. The N2S-3 has won three First Place Awards as well as Best in Show at shows in Texas. 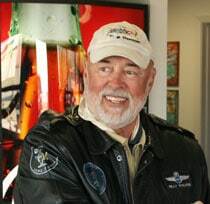 As of late, Captain Walker has been flying 964 in Arizona and was inducted into the Arizona Aviation Hall of Fame in 2011. He was excited to share his knowledge on the remarkable, iconic biplane, including its history, joys, and challenges. His personally authored Boeing-Stearman training guide can be downloaded here. An interesting bit of history Capt. Walker shared with me is that after the war, civilians bought Stearmans not just for agricultural purposes, but because there was a gasoline shortage and the military sold surplus aircraft full of gasoline. That’s how cheap they were! PT Stearman photo by Chad Horwedel, used under license CC BY-NC-ND 2.0. In addition to being built to survive the punishment student pilots inflict on training aircraft, the Boeing-Stearman was also designed to “wash out pilots,” Capt. Walker says. Out of the hundreds of airplanes Capt. Walker has flown, the most challenging is the Nieuport 17 single-seat biplane (he flew a replica with the Lafayette Escadrille a couple decades ago), and a close second is the Boeing-Stearman Model 75. The idea was to prepare pilots-in-training for the larger, higher-performance aircraft they would be flying in combat, and so Capt. Walker says the Stearman was built to be intentionally hard to control. 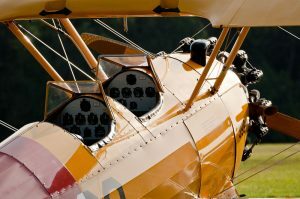 With its “tall, narrow gear” and the weight of the fuel in the upper wing, the Boeing-Stearman Model 75’s center of gravity forces you to wrestle it, especially on the ground. 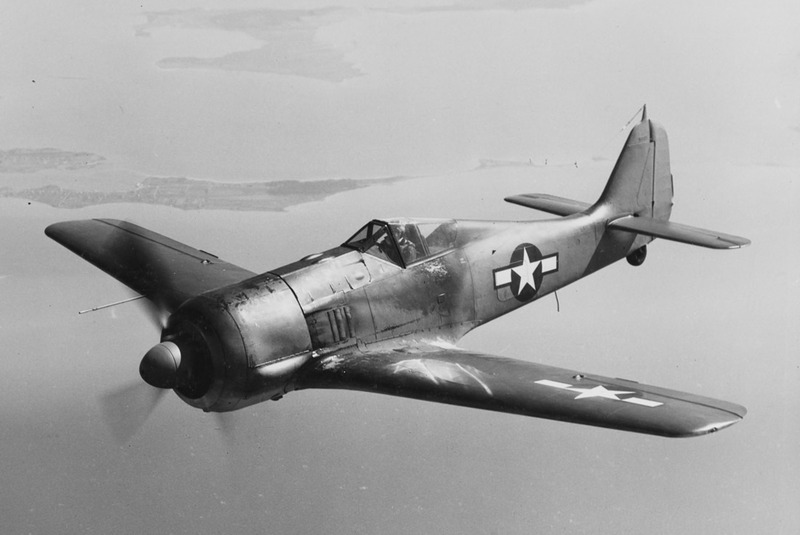 The heavy Model 75 PT-17 was fitted with a nearly 500 lb, seven cylinder 220 HP Continental R-670-5 radial engine pulled by a Sensenich wooden propeller. Most still-airworthy Boeing-Stearman’s now have higher-performance metal propellers, like Capt. Walker’s, which has a 102-inch diameter ground-adjustable McCauley propeller. US Navy 399 Boeing-Stearman, photo by Julian, used under license CC BY-ND 2.0. He warns pilots against the high rate of pilot error caused accidents when performing wheel landings in the Stearman, and encourages everyone to stick to three-point landings, whenever possible. “There are three sayings about Stearmans that are the absolute truth. There are only two types of Stearman pilots, those that have ground looped and those that will. You are not done flying a Stearman until its in the hangar, the hangar door is closed, and you’ve left the airport. Capt. Walker warns that if allowed to ground-loop, the Stearman almost always goes around to the left, ruining the right wingtip and aileron. Capt. Walker enjoys aerobatic maneuvers in the Boeing-Stearman Model 75 and says it performs the most beautiful loops. A friend of his once did 100 loops in a row! Capt. Walker says that he’s never been interested in that sort of aerobatic endurance test, but described for me his unique loop procedure. Instead of nosing over to gain speed and then pulling back hard on the yoke, he simply trims using the Flettner tab (used to trim out all the elevator forces) as the airplane accelerates to maximum level-flight speed (between 100 and 110 mph, says Capt. Walker). “Then, not putting any pressure on the control stick, the pilot quickly and forcibly moves the Flettner tab as far as possible as quickly as possible. Up and over you go with little to no loss of altitude. It ain’t pretty, but it is cool!” Capt. Walker explains. Appropriately, Davisson described stalling in the Boeing-Stearman Model 75 as “gentlemanly,” and explains that “if you force and yank real hard, yes, the stall will break. But when it does break, it doesn’t go anywhere. The Kaydet gives you plenty of time to correct. In a normal stall series, the plane simply drops the nose and mushes ahead until flying speed has been reached.” Speaking of speed, doing any maneuvers that require speed, like loops, necessitates “an awful lot of time going downhill trading altitude for speed.” Davisson says that it takes three or four minutes to regain the altitude lost performing a loop but states that this is not something the bigger horsepower Stearman’s have to worry about. Capt. Walker says that though the loop performance is amazing, the Stearman “doesn’t like to roll.” There’s not as much “lateral control,” because the standard Model 75 only has two ailerons per its four wings. Breitling Wingwalkers 1, photo by Tony Hisgett, used under license CC by 2.0. PT-13 Initial production. R-680-B4B engine, about 215 HP. PT-13A R-680-7 engine, about 220 HP. PT-13B R-680-11 engine, about 225 HP. PT-13C The same as the PT-13B, but modified for instrument flying. PT-13D R-680-17 engine, around 225 HP. PT-17A Modified for instrument flying. PT-17B Modified with agricultural spraying equipment. PT-18A Modified for instrument flying. Most Boeing-Stearman Model 75s have been upgraded with stronger, more reliable tailwheel assembly, modern brakes, higher tech radios (Capt. Walker says that instructors used to speak to the student pilot in the front seat through a rubberized tube that ran from their mouth to the students ear. Talk about a one-way conversation!) and more, which raise both the economic and practical value for pilots looking to buy one of their own. Though AOPA says6 you can pick up a Stearman for between $75,000-$125,000, a recent scan of three aircraft trading websites (Barnstormers, Trade-a-Plane, Controller) leads me to believe that might be a bit optimistic, with well-maintained Stearmans selling in the $98,000–$160,000 range (and up), with a few cheaper options scattered here and there. One ad for $58,000 caught my eye, before I realized it didn’t have any wings attached. Another for $35,000 blew my mind, but it’s apparently completely disassembled. Stearman, photo by Chad Horwedel, used under license CC BY-NC-ND 2.0. Regardless, this classic biplane warbird with all sorts of potential sells for around the price of a well maintained Piper Super Cub, so it’s not too far-fetched, financially. And if you just want to experience one, they’re very popular with flight tour companies and the like because they’re so much fun to fly, and the open cockpit allows passengers 360-degree visibility. Very few classic warbirds are available in such quantity and quality, and even fewer are sold for prices that don’t trigger heart attacks. According to Capt. Walker, there are probably thousands of Stearmans still flying today (more than the verified thousand or so), all thanks to the crop dusters. I’ve always been a huge fan of biplanes, and after spending some time (read: hours and hours) looking at pictures and watching videos, I’ve fallen in love with the hearty, visceral radial engines. 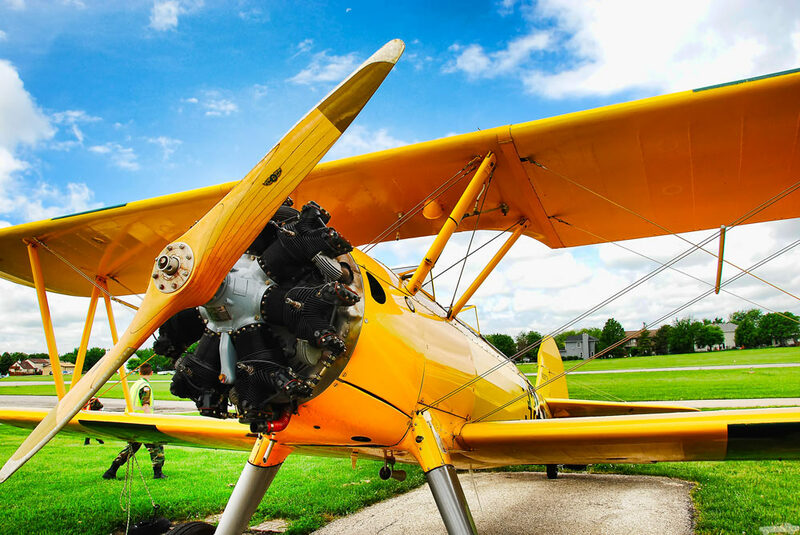 The Boeing-Stearman Model 75 with the 450 HP engine seems like the perfect airplane, capable of all sorts of aerobatic maneuvers and requiring the pilot to truly fly the whole time, meaning hands and feet moving and brain working. It doesn’t seem like a wise choice of primary airplane for those who like to travel, but if you’re in it to have fun for a couple hours at a time, and look very, very cool doing it, you can’t do much better than the Model 75. NOTE: If you’re interested in a flight in a Boeing-Stearman Model 75 or many other types of warbirds and live on the West Coast, check out the Commemorative Air Force | Air Base Arizona website, for their tour schedule and flight booking. Great story about a great airplane, My father was one of those people who picked up a Stearman 75 after the war. He was around 17 years old at the time and often waxed poetic about the plane, stopping to admire every time he saw one. He’s no longer with us, but I know he’s happy to see these airplanes still flying today. We would like to talk to someone in your organization about how to contact Stearman owner / pilots, across the S.E. United States Gulf Coast Region (TX-LA-MS-AL-FL), about participating in our Blackhawk Wounded Warrior Weekend events, staged mainly in New Orleans, Stennis International, Kiln, MS, Million Air FBO in Gulfport, MS, & NAS Pensacola, FL. 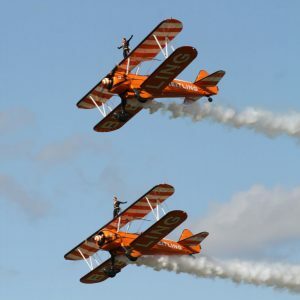 We’ve had Stearmans in our events on prior occasions & have always been impressed with the aircraft and the owner / pilots. We have a major event in the planning process @ present, for the Fall 2019, @ NAS Pensacola, that will be co-hosted by the National Naval Aviation Museum Foundation / National Flight Academy. We would like to invite a minimum of 5 Stearmans to attend. The Blackhawk mission has evolved over the past 8-9 years, since we were granted our tax exempt, 501(c)3 nonprofit status in 2008,…from providing educational opportunities for Veterans & their families, to doing the same for Law Enforcement personnel, & financially & socially disadvantaged children in need of educational & career counseling. We still have our Blackhawk Wounded Warrior Weekends (once a year,…our next is being planned for Fall 2019), but we’re concentrating more on events where we can see an immediate, positive result, such as the STEM Education programs that are now so popular around the nation. The 2019 Blackhawk Wings & Wheels STEM Education fundraiser, will be held @ the National Flight Academy, NAS Pensacola, FL, & will be co-hosted by the National Flight Academy & the National Naval Aviation Museum located @ NAS Pensacola, FL. The video links below will give you an idea of the type fundraisers we do for the children of Wounded Warrior & Law Enforcement personnel who have been killed or disabled in the line of duty.